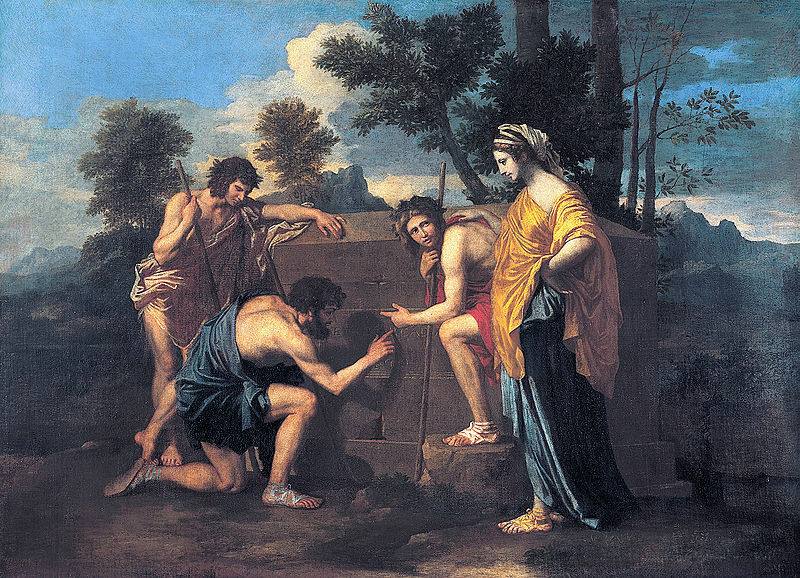 In Nicolas Poussin’s mid-seventeenth century painting, Et in Arcadia ego, shepherds have stumbled upon an ancient tomb on which the titular words are inscribed. Understood to be the voice of death, the Latin phrase may be roughly translated, “Even in Arcadia there am I.” Because Arcadia had come to symbolize a mythic pastoral paradise, the painting suggested the ubiquity of death. To the shepherds, the tomb was a momento mori: a reminder of the inescapability of death. Poussin was not alone among artists of the period in addressing the certainty of death. 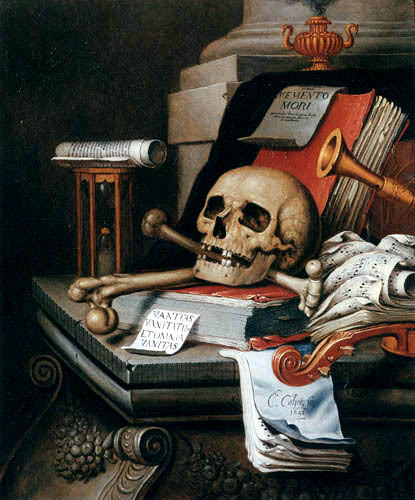 During the seventeenth and eighteenth century, vanitas art flourished. The designation stems from the Latin phrase vanitas vanitatum omni vanitas, a recurring refrain throughout the biblical book of Ecclesiastes: “vanity of vanities, all is vanity.” Paintings in the genre were still lifes depicting an assortment of objects which represented all of that we might pursue in this life. In their midst, however, one would also find a skull and an hour glass: symbols of death and the brevity of life. The idea, of course, was to encourage people to make the most of their living years. For the most part, we don’t go in for this sort of thing anymore. Few people, if any, operate under the delusion that we might escape death (excepting the Singularity folks I guess), but we do a pretty good job of forgetting what we know about death. We keep death out of sight and, hence, out of mind. We’re certainly not going out of our way to remind ourselves of death’s inevitability. And, who knows, maybe that’s for the better. Maybe all of those skulls and hourglasses were morbidly unhealthy. I honestly don’t know. But while vanitas art has gone out of fashion, a new class of memento mori has emerged: the social media profile. I’m one of those on again, off again Facebook users. Lately, I’ve been on again, and recently I noticed one of those birthday reminders Facebook places in the left hand column where it puts all of the things Facebook would like you to do and click on. It was for a high school friend whom I had not spoken to in over eight years. It was in that respect a very typical Facebook friendship: the sort that probably wouldn’t exist at all any longer were it not for Facebook. And that’s not necessarily a knock on the platform. I appreciate being able to maintain at least a minimal connection with people I’d once been quite close to. In this case, though, it demonstrated just how weak those ties can be. Upon clicking over to their profile, I read a few odd birthday notes, and very quickly it became obvious that my high school friend had died over a year ago. It was a shock, of course. It had happened while I was off of Facebook and news had not reached me by any other channel. But there it was. Out of nowhere and without warning my browser was haunted by the very real presence of death. Momento mori. Just a few days prior I logged on to Facebook and was greeted by the tragic news that a former student had unexpectedly passed away. Because we had several mutual connections, photographs of the young man found their way into my news feed for several days. It was odd and disconcerting and terribly sad all at once. I don’t know what I think of social media mourning. It makes me uneasy, but I won’t criticize what might bring others solace. In any case, it is, like death itself, an unavoidable reality of our social media experience. Death is no digital dualist. Facebook sometimes feels like a modern-day Arcadia. It is a carefully cultivated space in which life appears Edenic. The pictures are beautiful, the events exciting, the face are always smiling, the children always amusing, the couples always adoring. Certain studies even suggest that comparing our own experience to these immaculately curated slices of life leads to envy, discontent, and unhappiness. Naturally … if we assume that these slices of life are comprehensive representations of the lives people lead. Of course, they are not. But there, alongside the pets and witty status updates and wedding pictures and birth announcements, we will increasingly find our social media platforms haunted by the digital, disembodied presence of the dead. And so it is with our digital utopias, our virtual Arcadias. I found your article beautifully written and your literary references very interesting. But couldn’t one say that the persistence of Facebook profiles after one dies is an argument in favor of digital dualism and not against it? In my view, the fact that physical death and social death are no longer simultaneous (and I’m using the word social, precisely -at least I hope so-, in an ‘augmented’ perspective that is not exclusive to so-called ‘social’ networks) could perhaps challenge a monistic view : the way people keep adding content to profiles of those who have passed constitutes an evergrowing, active, interpersonal identity for the deceased. No? I see your point certainly, and I wouldn’t disagree. Here’s what I was getting at: death and its consequences are felt online as well as off.